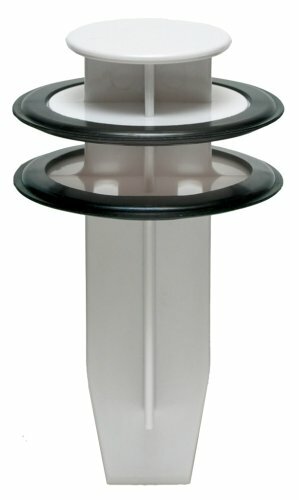 MST-10 Features: -Removes food from plates and a plunger to push the food into the disposer. -Functions as a stopper to plug the drain opening. -Acts as a cutlery guard. -Fits virtually to all popular disposers. -Treated with bio shield anti microbial for odour protection. -Reduce disposer noise and prevents splash back. Finish: -White. Primary Material: -Plastic. Dimensions: Overall Height - Top to Bottom: -3.5". Overall Width - Side to Side: -5.5". Overall Depth - Front to Back: -5.5". Overall Product Weight: -0.31 lbs. 1 - SCRAPER - Mr. Scrappy scrapes the food waste from your plate into the disposer. 2 - PLUNGER - Mr. Scrappy plunges the food waste through the disposer opening--eliminating the need to you your hands or eating utensil. 3 - CUTLERLY GUARD-Sits in the disposer when not in use. Act as a guard to prevent cutlery or other objects from accidentally falling into the disposer. Will still allow water to flow down the drain. 4 - STOPPER - Mr. Scrappy can also act as a stopper when the sink needs to be filled with water. If you have any questions about this product by Mr. Scrappy, contact us by completing and submitting the form below. If you are looking for a specif part number, please include it with your message.